Other Information: Store between 68 to 77 degrees F (20 to 25 degrees C). 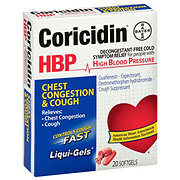 Misc: Cold symptom relief for people with high blood pressure. Dextromethorphan HBr - cough suppressant, chlorpheniramine maleate - anthistamine. American Heart Association health information enclosed. 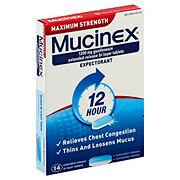 Relieves: cough; runny nose; sneezing. 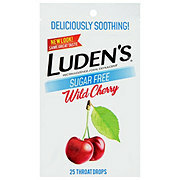 Decongestant-free. Made in Germany. 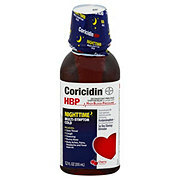 Uses: Temporarily relieves cough due to minor throat and bronchial irritation as may occur with a cold. Temporarily relieves runny nose and sneezing due to the common cold. 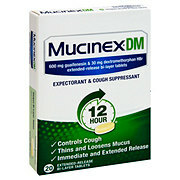 Ingredients Active Ingredients: In Each Tablet: Chlorpheniramine Maleate (4 mg), Dextromethorphan Hydrobromide (30 m g). Purpose: Antihistamine, Cough Suppressant. Inactive Ingredients: Croscarmellose Sodium, D&C Red 27 Aluminum Lake, FD&C Yellow 6 Aluminum Lake, Lactose Monohydrate, Magnesium Stearate, Microcrystalline Cellulose, Polyethylene Glycol, Polyvinyl Alcohol, Povidone, Talc, Titanium Dioxide. Warnings: Do not use: if you are now taking a prescription monoamine oxidase inhibitor (MAOI) (certain drugs for depression, psychiatric or emotional conditions, or Parkinson's disease), or for 2 weeks after stopping the MAOI drug. 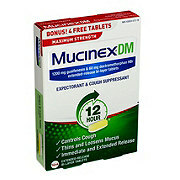 If you do not know if your prescription drug contains an MAOI, ask a doctor or pharmacist before taking this product. Ask a doctor before use if you have glaucoma; trouble urinating due to an enlarged prostate gland; cough that occurs with excessive phlegm (mucus); a breathing problem or persistent or chronic cough as occurs with smoking, asthma, chronic bronchitis, or emphysema. Ask a doctor or pharmacist before use if you are taking sedatives or tranquilizers. When using this product: excitability may occur, especially in children; marked drowsiness may occur; avoid alcoholic beverages; alcohol, sedatives and tranquilizers may increase drowsiness; use caution when driving a motor vehicle or operating machinery. Stop use and ask a doctor if: cough lasts more than 7 days, reoccurs, or occurs with fever, rash or persistent headache. These could be signs of a serious condition. Pregnancy/breast-feeding warning: If pregnant or breast-feeding, ask a health professional before use. Keep out of reach of children. In case of overdose, get medical help or contact a Poison Control Center right away. Other warnings: Abuse of this product can lead to serious injury. 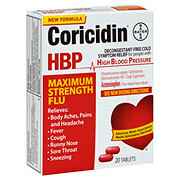 Safety Sealed: Do not use if foil imprinted with Coricidin HBP is torn or missing.